After releasing the full and final version of Windows 10 RTM OEM operating system for computers and laptops, Microsoft Windows Developers are still working hard to include more and more useful features and functions to the newest Windows 10 through regular updates via Windows Insider Preview program available for developers and general public users worldwide. The latest Windows 10 Insider Preview, Codename 19H1, Version 1903, Build 10.0.18362 (also called Windows 10 19H1, Windows 10 18362, Windows 10 1903) and Windows 10 Insider Preview, Codename 20H1, Build 10.0.18875 (also called Windows 10 20H1, Windows 10 18875) is instantly available for free download, upgrade, and manual offline installation through bootable DVD or USB flash drive on Windows-powered computers and laptops for testing and experimenting. Microsoft Windows 10 Preview insider (beta program) delivers new updates quite frequently and after some days of interval, so this is the best way to experience the all-new Windows 10 upcoming features, functionalities, and changes before it’s publicly released to general consumers. What's New in Windows 10 Insider Preview? Windows Insider Program allows users to take part in pre-release Windows 10 builds and versions of the operating system which was previously accessible to Windows developers only. It's an open software testing opportunity for anyone who wants to participate and sign up for free. There are different "Rings" introduced by Microsoft for testers and volunteers to get the regular Windows 10 Preview Updates. The four most common public rings are "Fast Ring", "Slow Ring", "Skip Ahead" and "Release Preview Ring". Those who opt for the fast ring will receive the updates prior to slow ring participants whereas; skip ahead ring users will get next year's closed insider preview builds, and after these three rings, release preview ring users will get updates. Fast ring and skip ahead users will have to face more issues and bugs as compared to other ring users. There are seven rings in total i.e. Fast, Slow, Skip Ahead, Release Preview, Microsoft Ring, Windows and Devices Group Ring, and Canary Ring. Windows 10 ISO Disc Image Files of Insider Preview are available in different multiple languages such as; English (United Kingdom), English (United States), Ukrainian (Ukraine), Spanish (International), Turkish (Turkey), Serbian (Latin, Serbia), Slovenian (Slovenia), Russian (Russia), Romanian (Romania), Portuguese (Brazil), Portuguese (Portugal), Polish (Poland), Norwegian, Bokmål (Norway), Thai (Thailand), Korean (Korea), Swedish (Sweden), Japanese (Japan), Hungarian (Hungary), Italian (Italy), Hebrew (Israel), Slovak (Slovakia), Greek (Greece), German (Germany), Spanish (Mexico), French (Canada), French (France), Estonian (Estonia), Finnish (Finland), Arabic (Saudi Arabia), Dutch (Netherlands), Danish (Denmark), Latvian (Latvia), Czech (Czech Republic), Chinese (Traditional, Taiwan), Croatian (Croatia), Chinese (Hong Kong), Chinese (Simplified, China), Lithuanian (Lithuania), Bulgarian (Bulgaria), and several other regional languages. Free Windows 10 ISO Preview Files are available in eight editions having different features and functions. Below is the list of all Windows 10 Preview Editions ISO Files currently available from Microsoft's website officially and legally. The hardware requirements to run Windows 10 Preview operating system on PCs and Laptops are same as the Windows 10 Final Version. CPU: Minimum clock rate of 1.0 GHz. Memory: Recommended 4 GB RAM, minimum 1 GB for 32-bit and 2 GB for 64-bit. Storage: Minimum 20 GB HDD/SSD for x64 and 16 GB for x86. GPU: Minimum DirectX 9 or WDDM 1.0 higher driver. Recommended WDDM 1.3 or later. Display: Minimum 800x600 pixels display screen. Recommended 1024x768. How to Update Windows 10 to Latest Preview Builds Versions? Step 1: Go to PC "Settings" directory through the Start Menu or Notification Panel. Step 2: Go to the "Update and Security" section. Step 3: On the left sidebar, Click on "Windows Insider Program" and press button "Get Started". Step 4: Change the setting from "Slow Ring" to "Fast Ring" or to "Skip Ahead" to Get Free Insider Preview Builds. Step 5: Click on the button "Check Now" and then Press the button "Download Now" to start downloading the latest preview updates. Windows users can enter the Genuine Activation Key of Windows 10, Windows 8.1, Windows 8, or Windows 7 to Activate Windows 10 Insider Preview. Windows 10 Preview will be expired as soon as the new preview builds released by Microsoft, so you should keep updating your operating system with new builds and versions on regular basis, or you can remove/uninstall/reinstall Windows 10 Preview version to further extend the time period of product expiry. 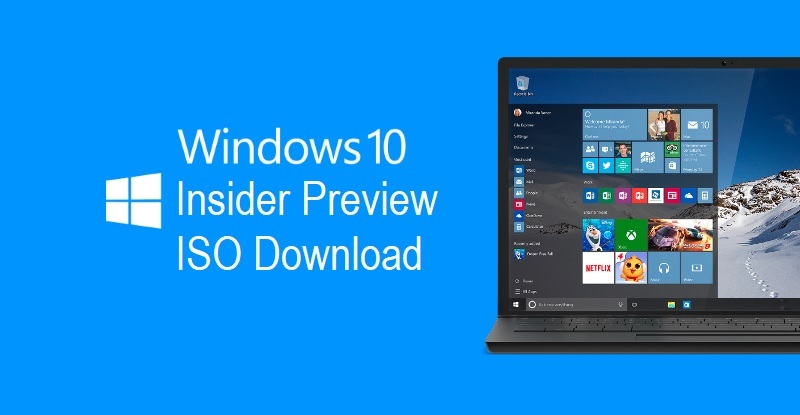 How to Download Windows 10 Insider Preview ISO Files via Direct Official Links? Microsoft itself promoting insider preview program by sharing the Official Download Links of Windows 10 Preview ISO 32-bit (x86) and 64-bit (x64) with Language Pack Bundle available in multiple languages. Windows 10 users can free download ISO files from the Microsoft website officially and legally and can perform the manual offline installation on multiple devices after burning ISO image files on USB or DVD. Download and Install Windows 10 Insider Preview Standalone Offline Setup Installer ISO Files via Official Links shared by Microsoft below. You must log in from your Microsoft Account via Outlook, Hotmail, Live etc. email address to get following direct official links for free.